A Daughters of the Confederacy Chapter C. C. B. 348 ribbon owned by Jesse Street Roberts, the great aunt of the contributor of this item, Luticia "Tish" Gormley Lee. Roberts migrated to Sanford, Florida, from Wilmington, North Carolina, sometime around 1910. Following the American Civil War, numerous associations were founded by women to organize the burials, funerals, commemorations, and monuments honoring the Confederacy. The majority of these individual associations were merged into the National Association of the Daughters of the Confederacy, led by Caroline Meriwether Goodlett and Anna Davenport Raines, on September 10, 1894 in Nashville, Tennessee, for daughters, granddaughters, and other female descendants of Confederate servicemen. In 1895, a meeting was held in Atlanta, Georgia, to change the name of the organization to the United Daughters of the Confederacy (UDC). The UDC was officially incorporated in Washington, D.C., on July 18, 1919. Roberts was presumably a member of the Daughters of the Confederacy, though it is not clear if this particular chapter was integrated into the UDC. Original ribbon: Private Collection of Luticia "Tish" Gormley Lee. Digital reproduction of original ribbon. Originally created by the Daughters of the Confederacy. Inherited by Luticia "Tish" Gormley. Copyright to this resource is held by Luticia "Tish" Gormley and is provided here by RICHES of Central Florida for educational purposes only. "About the UDC." United Daughters of the Confederacy. http://www.hqudc.org/history-of-the-united-daughters-of-the-confederacy/. Cox, Karen L. Dixie's Daughters: The United Daughters of the Confederacy and the Preservation of Confederate Culture. Gainesville, Fla: University Press of Florida, 2003. Janney, Caroline E.Burying the Dead but Not the Past: Ladies' Memorial Associations and the Lost Cause. Chapel Hill: University of North Carolina Press, 2008. 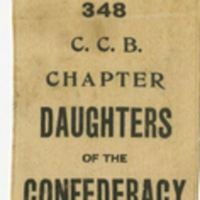 “Daughters of the Confederacy Ribbon.” RICHES of Central Florida accessed April 20, 2019, https://richesmi.cah.ucf.edu/omeka/items/show/3088.